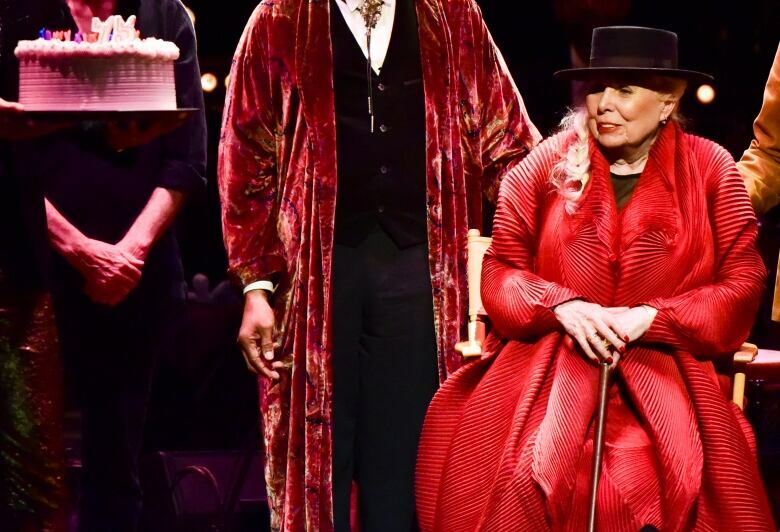 Canadian icon Joni Mitchell was honoured in Los Angeles on Wednesday with a star-studded, gala celebration marking her 75th birthday. 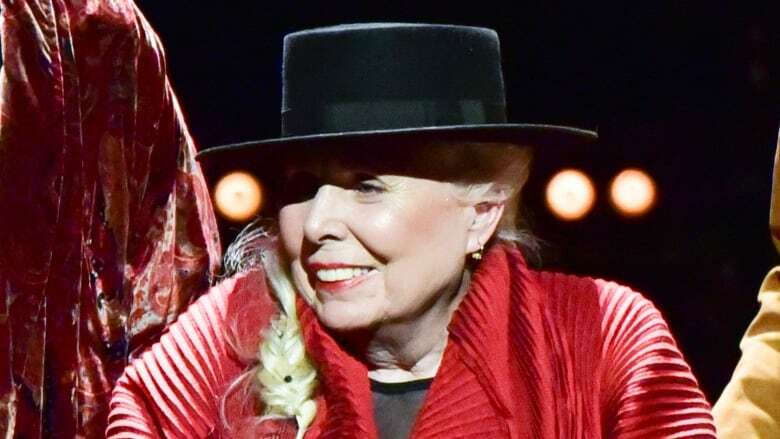 Canadian icon Joni Mitchell was honoured in Los Angeles on Wednesday with a star-studded gala marking her 75th birthday — and she had a front-row seat to take in the celebration alongside guests such as George Takei, Mandy Moore, Rita Wilson and Tom Hanks. "Every woman in my world lived and died by Joni Mitchell," Hanks said on the red carpet before the event. "So in a lot of ways, I enjoyed this great vicarious understanding of what her artistry was." Celebrity guests discuss Joni Mitchell's influence on them in the video below. Mitchell, dressed in her signature black hat and a long red jacket, did not speak with reporters but took the stage at one point to accept a birthday cake while surrounded by musicians. 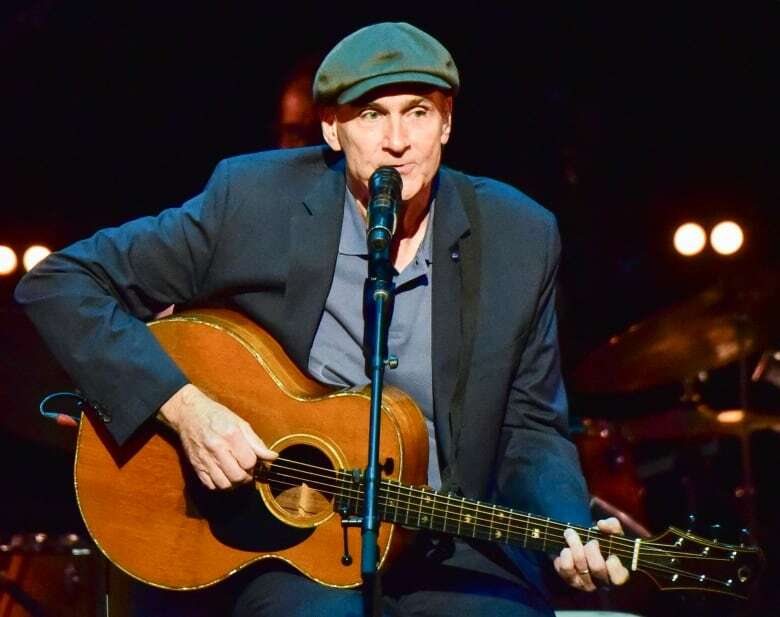 JONI 75: A Birthday Celebration included numbers by James Taylor, Emmylou Harris, Norah Jones, Seal and Chaka Khan, who performed songs from Mitchell's extensive repertoire. 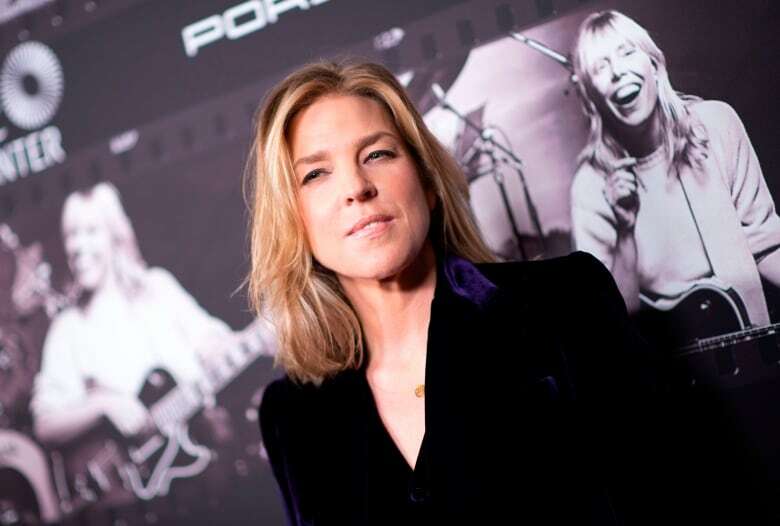 Canadian musicians Diana Krall and Rufus Wainwright also took part. Wainwright said the tribute was particularly moving given Mitchell's recent health scare: she was hospitalized for a brain aneurysm in 2015. Fans were told at the time that she was expected to make a full recovery, however details of her physical health have been kept private in recent years. 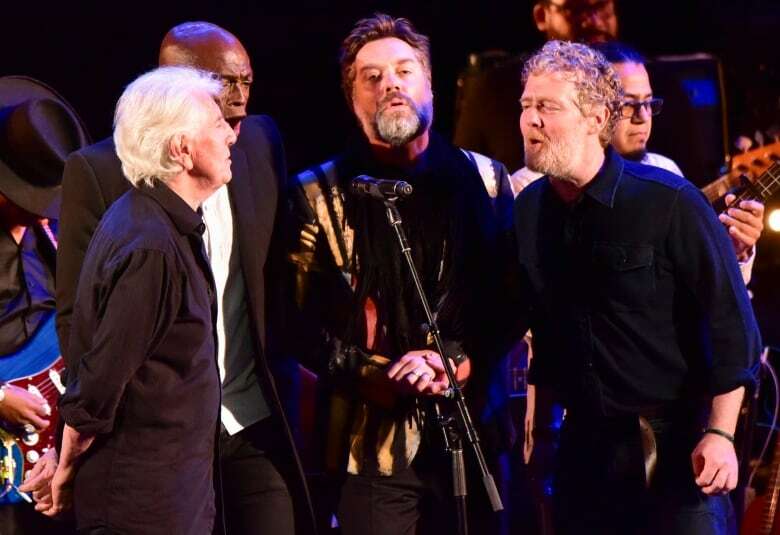 "The epic story we've all witnessed of her learning how to walk again and really communicate, I think it will be pretty deep," said Wainwright about the tribute. Known for timeless classics such as Both Sides Now and Big Yellow Taxi, the legendary singer-songwriter appeared to be in good health and spirits at the evening's soirée — her actual birthday. "She is still, and always, Joni," said Taylor, a longtime friend and musical collaborator. "That energy, it continues. She's a world treasure. I know she's a national treasure if you're Canadian — and you're absolutely right to be proud of her — but she belongs to the world." Danny Kapilian, the program's music producer, said Mitchell's "fearlessness" is part of what's made her so legendary in the industry. "She's very possibly the most brave lyricist, apart from Bob Dylan and Leonard Cohen and maybe Neil [Young]," Kapilian said. "But Joni really goes to a place that even they don't. Joni's perspective as a woman from her place and time is unique. Her fearlessness is the main thing that I think comes through." The Saskatoon-raised Mitchell became part of Southern California's blossoming folk scene in the late 1960s. Her breakthrough second album Clouds — featuring hits Both Sides Now and Chelsea Morning — won Mitchell her first Grammy for best folk performance. That was followed by her 1970 album, Ladies of the Canyon, featuring what would become two defining anthems: Woodstock and the environmental ode Big Yellow Taxi, with the now-famous lyrics "they paved paradise and put up a parking lot." "The general message of my songs, I guess, is just happiness," Mitchell told CBC in 1967, during an interview early in her career. "Most of them have happy endings, and I don't write protest-y things. If they protest at all, it's very subtle." In all, the Saskatoon-raised musician has recorded 19 studio albums and won nine Grammy Awards, including a lifetime achievement award in 2002. She was inducted into the Rock & Roll Hall of Fame in 1997 and became a companion of the Order of Canada in 2004. Her 1971 album Blue is ranked 30 on Rolling Stone magazine's list of the "500 Greatest Albums of All Time." "She's a great musician and she's influenced me as a pianist," said B.C.-born Krall. "It's very complex the way she plays. It's very unique and there's always a running thread of jazz in everything." With a decades-long career of genre-transcending music, Mitchell has been notably unconcerned with seeking commercial success. "The trick is if you listen to that music and you see me, you're not getting anything out of it," Mitchell said in a 2013 interview with CBC News, discussing her legacy as an artist. "If you listen to that music and you see yourself, it'll probably make you cry and you'll learn something about yourself and now you're getting something out of it." A gala following Wednesday's concert also served as a fundraiser to benefit The Music Center, a non-profit performing arts organization that is home to the LA Opera and LA Philharmonic. "She's always seen herself, rightly, as an artist who has gone her own way, the commercial marketplace be damned," said Kapilian. "And whoever gets it, gets it." Zulekha Nathoo is based in Los Angeles and has sat down with some of Hollywood's biggest names, including Denzel Washington, Cameron Diaz, Robert Downey Jr. and Matthew McConaughey. She also works as a CBC News on-air reporter, and has spent more than a decade at stations across Canada.